Zamość (pronounced Zah-moesh-ch) is a town in Lublin Voivodeship, Poland. Often nicknamed "the Pearl of the Renaissance" (Polish: Perłą renesansu), the town was among one of the epicenters of the Renaissance in the Polish-Lithuanian Commonwealth during the late 16th century. An important Polish trading and military center for many centuries, Zamość also played an important role in the development of Hasidic Judaism in Central Europe. In 1992, Zamość's Old City was designated as a UNESCO World Heritage Site due to its outstanding Renaissance-era Mannerist architecture. With a contemporary population of nearly 65,000, Zamość today has developed into a growing tourist destination for travelers in eastern Poland. The main square of Zamość. Founded in 1580 by Jan Zamoyski, the chancellor and commander-in-chief of the Polish-Lithuanian Commonwealth, Zamość modeled itself after Italian defensive and trading towns. With the assistance of genius Italian architect Bernardo Morando, Zamość was designed to incorporate the ideals of a Renaissance-era city, complete with a street grid plan and defensive military fortifications. Placed along a trade route linking northern Europe to the Black Sea, Zamość flourished during the early 17th century, attracting Polish, Ukrainians, Lithuanians, Greeks, Armenians and Jews to settle in the growing town. Zamość's strong fortifications proved effective when, in 1648, rebel Cossack leader Bohdan Khmelnytsky failed to take the town after a siege. The Swedish army additionally failed to overcome Zamość's stubborn defenses eight years later in 1656 during the Deluge, a highly destructive Swedish invasion that laid waste to much of the Commonwealth, though thankfully spared Zamość. However, the town raised the white flag to Swedish forces during the Great Northern War in the early 18th century, occupying the town 1704, and again between 1715 to 1716 under Saxon troops. During the First Partition of Poland in 1772, Zamość was annexed by Austria, remaining within its realm until 1809, when the town briefly became part of the Duchy of Warsaw, a French puppet state created under Napoleon I. After Napoleon's humiliating defeat in Russia, Zamość was placed yet again into another puppet state, Congress Poland, helmed by the Russian Empire. During the November Uprising of 1830 to 1831, Zamość joined the anti-Russian resistance, and was one of the final rebel locations to surrender to imperial troops. As a direct consequence to the rebellion, Zamość's lands were completely annexed by Russia. After the Russian Empire's defeat in the Crimean War, the imperial army decided that Zamość's fortress was outdated and no longer served its purpose, leading authorities to begin tearing down sections of the fortress. This act allowed the town to expand significantly outside its original walls. Towards the closing of the 19th century, nearly 10,000 called Zamość home. Among those born in Zamość during this period were Marxist theorist Rosa Luxemburg and Polish prime minister Leopold Skulski. In the opening months of World War I, Austria-Hungary successfully defeated Russian forces outside of the town, leading to a four-year occupation. Due to a concoction of war exhaustion and budding ethnic nationalism, Austria-Hungary quickly collapsed in late 1918, driving Zamość to quickly join the newly independent Second Polish Republic. Only a month after Polish independence, a communist uprising led on by disenfranchised soldiers and farmers broke out in the town. In response, Polish Army units from Lublin were quickly mobilized to crush the rebellion. During the Polish-Soviet War in August 1920, Red Army units surrounded the town in an effort to lay siege, though Soviet forces were quickly defeated by counterattacking Polish troops. For the rest of the interwar period, Zamość continued to expand territorially and economically. It was also during this time that famous Polish poet Bolesław Leśmian resided in in the town, working as a lawyer. The colorful Armenian houses on the Great Market. During the joint invasion of Poland by Nazi Germany and the Soviet Union in September 1939, Zamość was occupied by both German and Soviet troops. Following an agreement between both sides, Germany was granted occupation rights over the town and its surrounding region. For the next five years, the Nazis unleashed a five-year reign of terror, deporting Zamość's sizeable Jewish population to the death camps, while ethnic Polish faced imprisonment and on-the-spot executions. Under the occupation, Zamość's name was changed to Himmlerstadt (after SS commander Heinrich Himmler) and later Pflugstadt in order to reflect the Nazis desire for a German community there. As a result, the surrounding region was cleared of ethnic Poles, with the Nazi racial goal to replace Slavs with ethnic German farmers. Nearly 8,000 people, including Jews, Poles and Soviet prisoners of war, were executed by the Germans in Zamość's former military fortifications. In response, insurgent Polish and Soviet partisans waged a guerilla war against the German military occupation and would-be German colonists between 1942 to 1944, a time known as the Zamość Uprising. Eventually the Soviet Red Army dislodged the Germans altogether from Zamość in 1944 in the war's final stages. Although the town largely escaped physical damage during the war, the cost to its citizens was enormous, resulting in nearly half of Zamość perishing in the conflict. In the communist period that soon followed, Zamość experienced yet another boom, as the city significantly expanded again due to trade and industry. Between 1975 to 1998, the town served as the provincial capital of Zamość Voivodeship, a title that it later lost to Lublin during the reorganization of provinces at the end of the 1990s. In 1992, Zamość's Old City was declared a UNESCO World Heritage Site due to its outstanding Renaissance-era architecture. In 1998, Pope John Paul II visited the town during one of the pontiff's pilgrimages. Today, Zamość has yet to reach the tourist heights of other cities in the republic, such as Warsaw, Kraków, or Wrocław, though its name has started to reach a larger tourist audience, wishing to find the next relatively unknown spot in Central Europe. One of the closest gateways to Zamość by air is Lublin Airport (LUZ), located just east of the provincial capital Lublin. The airport is serviced by Wizzair, Ryanair, and BMI Regional. Lublin Airport can be accessed by national roads DK17 (E372) and DK12, and is nearly 80 km (50 mi) northwest of the town, or nearly an hour's drive. Another option for flying is Rzeszów–Jasionka Airport (RZE), situated outside the city of Rzeszów, 145 km (90 mi) southwest of Zamość, or nearly a two and a half hour drive on highways DK74 and DK19. The airport is serviced by Ryanair, along with major carriers LOT and Lufthansa. Zamość is served by both national rail operator PKP Intercity and regional operator PolRegio, although PolRegio presently handles the bulk of the city's passenger traffic. Visitors arriving by rail will use Zamość's main train station, denoted as Dworzec PKP on most maps. The station is located at ul. Szczebrzeskiej 11 and is a 15 minute walk west of the Old City. All train schedules can be researched by the Rozklad-PKP timetable. The town's main bus station, Dworzec Autobusowy, is located east of the Old City at Hrubieszowska 1 at the foot of the Rondo Romana Dmowskiego roundabout, and is nearly a 30 minute walk from the Old City. International bus carrier Eurolines maintains a stop in the town, with several connections to other cities in Poland and Europe. There are several other smaller bus companies that offer connections to Zamość's surrounding communities, other destinations in Lublin Voivodeship, and to other parts of the country. Many of these bus lines can be researched by e-podroznik.pl. Zamość is located at the intersection of national roads DK17 (E372) running north to south and DK74 running east to west, as well as provincial highways DW843 from the northeast, DW837 from the northwest and DW849 from the southwest. There are presently no motorways or expressways near the city, although there are plans to expand the S17 expressway to the town in the coming future. Zamość is an hour's drive southeast of Lublin, an hour south of Chełm, and over two hours northwest from Rzeszów. The Ukrainian border is nearly an hour and fifteen minute drive to the east. All of Zamość's major attractions can be explored easily by foot. However, for tourists wishing to explore outside of the town's historic core, people can use Zamość's public bus system Miejski Zakład Komunikacji w Zamościu, abbreviated as MZK. Municipal buses are colored yellow and red, with routes spread across the town. Town Hall (Ratusz) — designed by Italian architect Bernardo Morando, construction began on the Town Hall in 1591. Further remodelings were made between 1639 to 1651 in order to reflect the building's surrounding Mannerist architecture, with the structure's iconic sweeping double staircase later added in the 18th century. Today, Town Hall is now one of Zamość's icons; its imposing tower looms 52 meters (170 feet) over the town's central square. During the summer months at noon, a trumpeter at the top of the hall sounds the hour in three directions, ignoring the fourth direction as it faces towards Kraków, a quirk stemming from a 16th century grudge with that city. Great Market Square (Rynek Wielki) — surrounded by centuries-old arcaded apartments that formerly housed Zamość's merchant elite, the Great Market is exactly 100 meters in both width and length and provides an excellent panorama view of the Old City. Among one of Poland's most famous squares, the Great Market is a focal point for any visit to the town. Visitors should also note the colorful Armenian Houses next to the Town Hall, which once were the homes of the town's small Armenian merchant community four centuries ago. Zamość Cathedral (Katedra Zamojska) — also known as the Cathedral of the Lord's Resurrection and St. Thomas the Apostate, this beautiful structure is again one of architect Bernardo Morando's creations, constructed between 1587 to 1598, with decorations completed later in 1630. Inside is an impressive Baroque high altar, as well as a chapel for the influential Zamoyski family, who used the cathedral as a family mausoleum. Zamość Synagogue (Synagoga w Zamościu)  — one of the best preserved late-Renaissance synagogues in the country, this structure was built in 1610, taking eight years to complete. Originally intended for Zamość's majority Sephardic population, who had arrived from Spain, Portugal, and the Ottoman Empire beginning in the 1580s, the community soon assimilated with fleeing Ashkenazi Jews arriving from Western Europe and fleeing civil strife in Ukraine. The synagogue served the community's Jews until World War II, when the Germans commenced deportations and executions, damaging much of the northern half of the building. The structure underwent renovations in the late 1960s and later again in the early 2010s. Today, the synagogue is used as a museum, conference center, and a site for cultural events. The building is an excellent relic of Poland's pre-industrial Jewish past. Zamość Rotunda (Rotunda Zamojska)— originally a circular defensive fortification built in the 1830s during Zamość's Russian era, the Rotunda was used extensively as a prison, transit area, and execution ground during the German occupation in World War II. The Rotunda bore witness to over 40,000 prisoners and 8,000 executions. A vast majority of the victims were Poles, Jews, and Soviet prisoners of war. Today, the grounds around the Rotunda serves as a graveyard and memorial for over 45,000 victims of the 1940s from the Zamość region, who perished both during World War II and in the Stalinist purges. Zamość Museum (Muzeum Zamojskie)  — located within the Armenian Houses on Great Market Square, this fascinating museum details the town's history, offering numerous artifacts and exhibitions. Town Park (Polish: Park Miejski) — designed between 1922 to 1927, Zamość's municipal park is located just northwest of the city's former military bastions. Incorporating old moats and defensive positions as lakes and gentle hillsides, the park is an excellent location to relax in the spring and summer months. The Great Market is transformed into a symphony of light and sound during the Zamość Cultural Festival. Take time to wander around the streets of the Old City, getting lost in various squares, arcaded passageways, old churches, and parks. Sit at an outside restaurant or cafe in the Great Market and soak in the atmosphere. Explore the quiet beauty of the town's surrounding fortress. Enjoy the Eurofolk Festival, held annually in July, drawing participants dressed in cultural costumes from across Europe, as well as Asia, Africa, and Latin America. Attend the Zamość Cultural Festival (Polish: Zamojski Festiwal Kultury), a large outdoor festival and concert held annually in the summer months in the Great Market. If there is one thing that cannot be said about Zamość, it is that the town is short of restaurants. On the contrary, restaurants are plentiful throughout the city, especially within the picturesque Old City. Dining options can vary throughout the town, ranging from fast food kebab and pizza take out services, to more established older restaurants in the town core. Bastion VII, one of the preserved surviving portions of Zamość's massive fortress. As mass tourism has yet to hit Zamość, the town's selection of lodging is still relatively inexpensive for visitors. Properties in the Old City are the most convenient for tourists, as they are located in the thick of the town's major sites, but are generally a little more expensive. 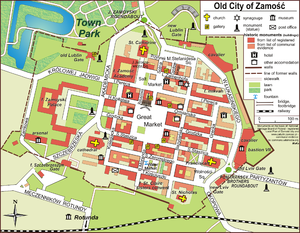 However, many properties located outside of the center are usually somewhat cheaper, yet may potentially require public transportation in order to go to the Old City. Town Park on a summer day. Located in the south of Lublin Voivodeship, Zamość is relatively close to several other attractions. Located 32 km (20 mi) southwest of the city on DW858 via national highway DK74 is Roztocze National Park, a heavily-forested protected area with some of the tallest trees in the country. Additionally, the Ukrainian border is not far from the town, which can be accessed either by driving 58 km (36 mi) south on DK17 (E372) towards Hrebenne, or by DK74 towards 71 km (44 mi) to the east towards Strzyżów. This page was last edited on 24 January 2017, at 18:18.